Seaside Belle: Uniform - does it stifle or help self-expression? Uniform - does it stifle or help self-expression? Little E is extremely excited at the moment, because he has a new nursery jumper. 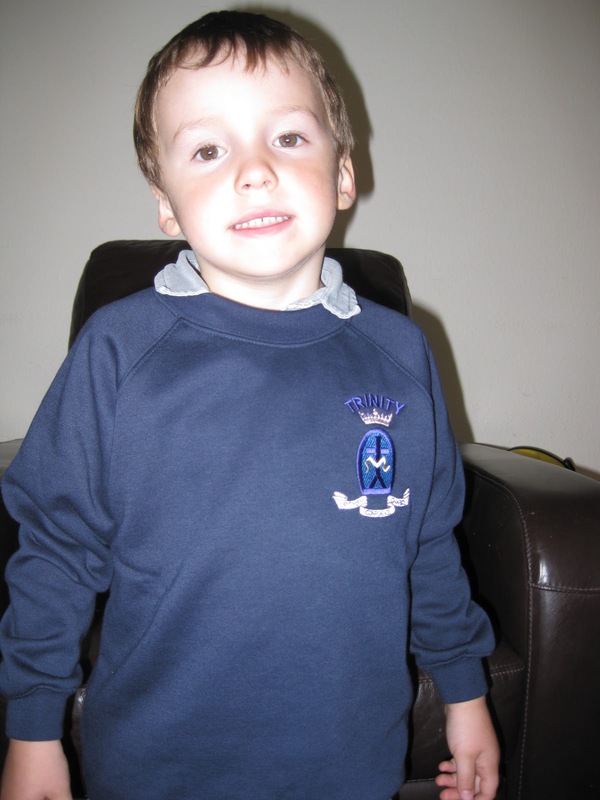 When the children go into the top class at nursery - pre-prep, they are allowed to wear the nursery jumper, although it is not compulsory. At first, I was reluctant to get him one. I see clothes as a way of expressing one's personality. And I reasoned that he will have to wear school uniform from next year anyway, so I wanted him to enjoy his last year of wearing what he wants for nursery. However, he was adamant that he wanted to get a jumper, so we bought him one. Since it arrived, he has wanted to wear it non-stop. Anyone who comes to the house, has to be shown the new jumper, particularly the badge. I went along to the nursery 'Harvest Assembly' last week and he very proudly showed the badge to his friend - as if to say, "Look, I've got a new nursery jumper, aren't I grown up?" It got me thinking. Was my reluctance to get him a new nursery jumper, me inflicting my not wanting to have to conform all the time on him? Why couldn't I see, that this jumper, with its all important badge, was a signal that he belongs to the top nursery class tribe? It's the thing that sets him apart from the children lower down the nursery. And, perhaps for Little E, who lost most of his best friends to school this year (he is a September baby, so has to wait another 12 months), it is a symbol of how close he is to going to big school. I do 'agree' with school uniforms. I believe they help put everyone on the same level (regardless of background and income level). I also believe they help instil the school's values in a child. And isn't the choice of school often down to its values? After all, the reason I hope to send Little E to a Catholic school is because I want the Catholic values reinforced through his education. I think perhaps my reticence was a fear that this would be the beginning of him wanting to belong to other 'tribes' marked out by branded clothes. Maybe it is. But I hope I am able to share with him the importance of self-expression. And, whatever clothes we choose to wear, big brand or unashamedly, contra-big brand, clothes are an extension of our personality. Like it or not, we often judge people by what they are wearing. I think I just want him to be aware that clothes don't change you, they merely reflect your personality and values. Or maybe I'm reading too much into the school jumper thing.